Located in the heart of downtown New Brunswick, Indochine has been satisfying the city for their cravings of Vietnamese cuisine for over 7 years. 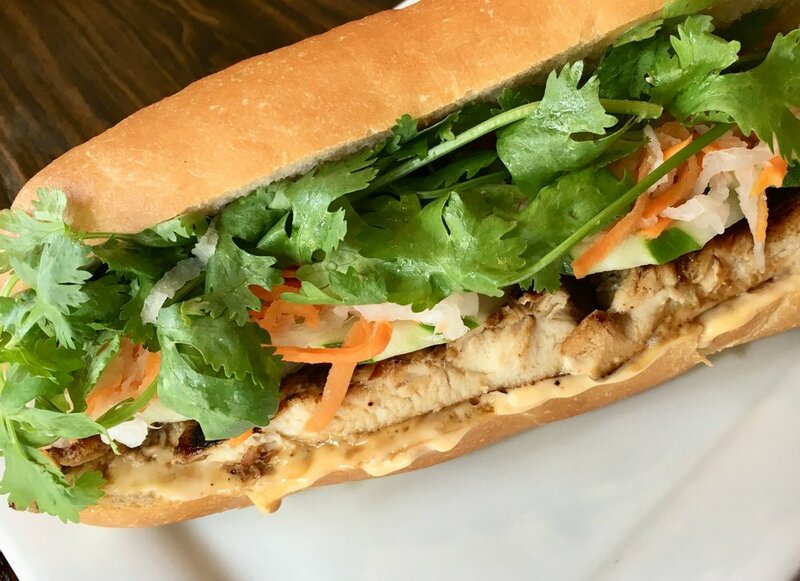 Indochine has been serving up traditional Vietnamese food for students, commuters, and residents of New Brunswick. All of our dishes are prepared and cooked in house to provide our customers the best possible experience in Vietnamese cuisine. Stop by for a meal before attending a show at the State Theatre located just two blocks away. Or if you prefer the comedy club, the Stress Factory is located just a few steps away. Convenience is not an issue as the Rutgers Campus buses stops right at our door steps and New Brunswick's parking deck is located right around the block. Chicken, taro, carrots and black mushroom fried in a crispy wonton roll. Served with cilantro, lettuce and a side of fish sauce. Pork, taro, carrots and black mushroom fried in a crispy wonton roll. Served with cilantro, lettuce and a side of fish sauce. Fresh spring rolls with chicken, shrimp, vermicelli rice noodles, shredded lettuce, mint, cilantro and bean sprouts wrapped in rice paper. Served with Vietnamese peanut sauce. Fresh spring rolls with pork, shrimp, vermicelli rice noodles, shredded lettuce, mint, cilantro and bean sprouts wrapped in rice paper. Served with Vietnamese peanut sauce. Mixed greens, onions, cucumbers and tomatoes. Served with house vinaigrette on the side. Grilled chicken and shrimp over the Garden Salad. Served with house vinaigrette on the side. Choice of chicken or tofu with shredded cabbage, mint, onions and fried shallots. Tossed with vietnamese dressing. Rare steak, brisket, tendon and tripe. Rare steak and beef meatballs. Spicy beef broth with round rice noodles, rare steak and pork roll. Vermicelli rice noodles with shredded lettuce, mint, cilantro, bean sprouts, pickled radish & carrot, and crushed peanuts. Served with fish sauce. N2 Noodles with grilled pork and an eggroll. N3 Noodles with grilled pork, shrimp and an eggroll. N4 Noodles with grilled chicken and an eggroll. N5 Noodles with grilled chicken, shrimp and an eggroll. N6 Noodles with sautéed tenderloin beef and onions. N7 Noodles with grilled shrimp. Choice of white or brown rice. Garnished with lettuce, tomato, cucumber, pickled radish & carrot. Substitute with fried rice for $2. Add a fried egg for $1. 2pc marinated in vietnamese spices. with lemongrass, bell pepper and onion. with green onion and ginger. R7 Sautéed shrimp and mixed vegetables. Tofu, taro, shredded carrots and black mushroom fried in a crispy wonton roll. Served with cilantro, lettuce and a side of soy sauce. Fresh spring rolls with sautéed tofu, carrot and jicama with vermicelli rice noodles, shredded lettuce, mint, cilantro and bean sprouts wrapped in rice paper. Served with peanut sauce. Rice noodle soup with tofu, broccoli, carrots and straw mushrooms in a fragrant, clear vegetarian broth. Garnished with onions, cilantro, green onions, bean sprouts, jalapeño peppers, lime and Asian basil. Vermicelli rice noodles with tofu, broccoli, carrots, straw mushrooms and a vegetarian eggroll. Served with a bed of shredded lettuce, mint, cilantro, bean sprouts, pickled radishes and carrots, crushed roasted peanuts and soy sauce. Sautéed tofu, mushrooms, broccoli, carrots, onion. Garnished with lettuce, tomato, cucumber, pickled radish & carrot. Served with a choice of white or brown rice. Sautéed tofu, peas, carrots, scallions, and ginger. Garnished with lettuce, tomato, cucumber, pickled radish & carrot. Served with a choice of white or brown rice. Tofu, mushrooms, broccoli, carrots and onion sautéed in curry sauce. Garnished with lettuce, tomato, cucumber, pickled radish & carrot. Served with a choice of white or brown rice. Crispy baguette with choice of filling. Served with mayo, cucumber, jalapeño, cilantro and pickled radish & carrot. Make your sandwich a combo and get fries and a soda for $2. Add a fried egg for $1. Jasmine, green, lemon ginger or chai. Iced or hot. Avocado, Banana, Lychee, Mango, Pineapple, Strawberry.